If we look with different eyes to our own human body, we can be just as marvellous and exotic as the birds of paradise. We seem to be unaware of our non-verbal communication and the unending power of imagination that our bodies can express. 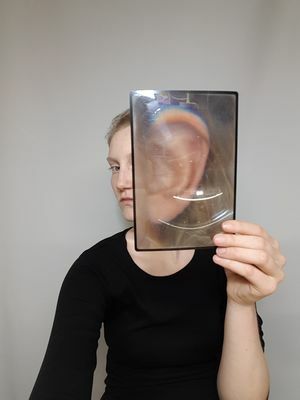 During her studies Hanneke Klaver has developed a strong fascination for the human body, human behaviour and our communication. The installation #freetheexpression shows a research into the oddities of human interaction. Our faces have a very sophisticated set of muscles, unconsciously trained to pass information to others. This minimalistic communication becomes visible by placing instruments on specific points of the face. The instruments make it possible to explore the facial expression in a much broader sense. #freetheexpression is part of Hanneke’s graduation collection “Catch Air – play it, dance it, spread it”. Through film and performance and with a humorous touch, she invites the public to cross predictable standards.